Designed for use in a sheltered environment, Cortec's ElectriCorr VpCI-248's continuous vapor action saves money by extending product life and eliminating downtime due to corrosion. ElectriCorr VpCI-248 forms a molecular film effective against aggressive environments, including industrial, marine and tropical climates. This film does not alter the electrical, resistance or magnetic properties. ElectriCorr VpCI-248 can be safely applied for protection of even low-voltage circuits or relays without causing any changes in conductivity. It can be safely used with plastics, elastomers and other non-metallics. In addition to corrosion protection, ElectriCorr VpCI-248 is an excellent contact cleaner of oils, grime and other contaminants. 9.45 oz. aerosol spray. 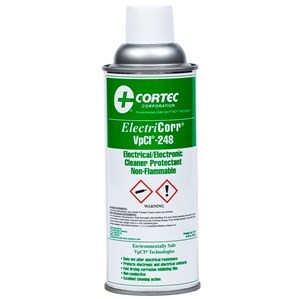 ElectriCorr VpCI-248 is an effective inhibitor of galvanic corrosion for most metals and alloys normally found in electronics applications, such as aluminum, copper, ferrous and non-ferrous metals. Application provides instant corrosion protection. ElectriCorr VpCI-248 is thermally stable, non-flammable, and based on environmentally sensible fluorocarbon solvents, which are exempts from VOC regulations by the US EPA. Protects copper bearings, ferrous and non-ferrous metals, aluminum, etc. Spray a very light mist over the area needing protection. Note: Application of a heavy mist will result in a heavy film that sags and remains wet. More is not necessarily better and could cause fouling or other complications of electrical connections. Application is effective for 6+ months with proper controls. ElectriCorr VpCI-248 should be kept from high temperatures and in normal warehouse conditions to prevent from freezing. ElectriCorr VpCI-248 has a shelf-life of 3+ years in sealed packages.